Two mass heroes going the experimental route? Hero Ravi Teja is fondly called as Mass Maharaja by his fans. He has been primarily doing mass action entertainers since several years. However, he seems to be changing tracks for his next project. Ravi Teja reportedly gave his nod to a unique and experimental script narrated by VI Anand recently. On the other hand, young Mega hero Sai Dharam Tej, who has been trying his luck with a bunch of mass entertainers, has tried out an out-and-out romantic entertainer with the soon-to-release Tej..I Love You. Next, Tej is said to be in talks with acclaimed director Chandrasekhar Yeleti who’s popular for his experimental dramas like Aithe and Anukokunda Oka Roju. 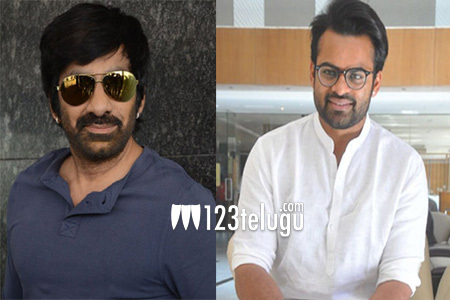 Official announcements regarding both Ravi Teja and Sai Dharam Tej’s movies will be out at an appropriate time. Stay tuned for further updates.